Eleven bags does about a third of an acre, so that’s what I spread in the middle-section of the field. Three bags filled the hopper. It’s what I need to kill the pastureland thorny weeds. There’s every kind of thistle, thorn, burr, and nettle out here – and as you can see it’s as dry as a bone. Weed prevention is an important aspect of fire suppression and keeping a defensive perimeter. 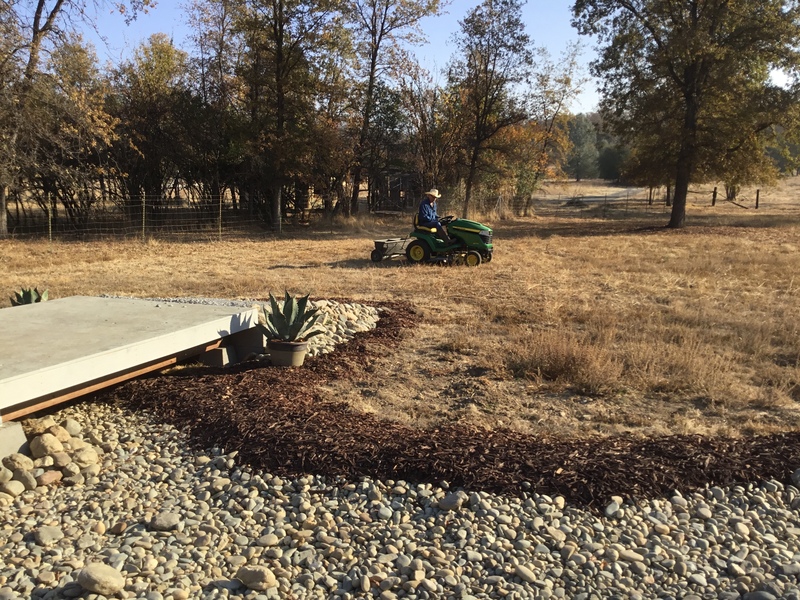 I had to pump-up the little tires on the spreader, and also the wagon that was holding the (rather expensive) material – some stuff called “Concern” that should not prove dangerous to my neighbor’s cattle. Rain forecast for Wednesday should be a great benefit to the fire-fighters, and this needs to get watered-in, so I had to do it now. I’d be happy with just controlling my weeds. You’re in it for your very lives out there. Godspeed, sir. On a tangential note, we had a fire start out here back in the summer, probably 4 or 5 miles from the house, in a stand of junipers (they go off like Roman candles when lit) within a forested area. We happened to be out on the road, plainly seeing the happenings from the highway as this went down. Took out maybe one whole acre before the FD got it under control. It was the first time I’d ever seen that kind of thing occur out this way, and let me tell you, it wasn’t pleasant. You guys live with that excrement on a completely different plane. It’s awful dry indeed! And supposedly this is a “wet” period for California! Local Natives like the Maidu and Miwok used to set fires to burn off the accumulated understory fuels, but activity like that was prohibited and limited to prescribed burns in the winter where giant (like 2-story high and more) piles of old logs get set on fire by CalFire…in the winter after it rains. Yep, getting a ‘head start’ as it were, will pay off in the spring, as long as you keep up the weed treatment. Nothin’ Runs Like A Deere! The X570 with locking diff is the bomb!